The next generation of tech-wizards have been learning the secrets of coding at a computing club in Moray. Children as young as seven have been unlocking the workings of technology to design their own games, create music and draw pictures. Coderojo Moray teaches the youngsters several coding languages to give them skills to get the most out of computers in later life. This month the club celebrates its third anniversary and now has more than 20 enthusiasts attending the monthly classes. Craigellachie pupil Cailan White, 11, has created his own games in the past – designing characters to chase after prey to collect points against the clock. He said: “Coding is fun because you can create anything you want with it. There are lots of different things you can do with it. 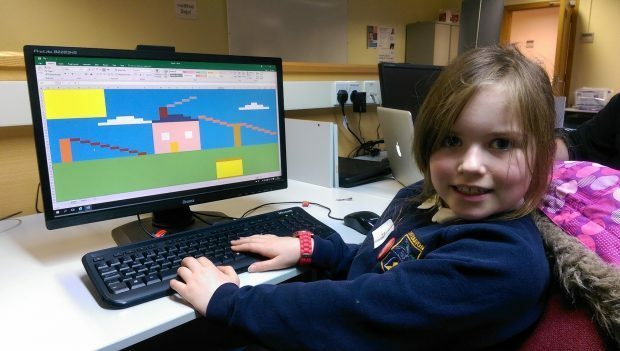 Last night Inveravon primary school pupil Flo Spilsbury-Roberts, nine, designed her dream house using coding language and ordered cartoon characters to move across the screen. Claire Griffiths, who runs the club at Moray College in Elgin, teaches computing and information technology at primary and secondary schools across the region. She explained the youngsters would reap the rewards of learning the language as they grow up. She said: “It gives them an understanding of how computers work. It’s like a car. Those that can do basic maintenance get more out of them than the ones that can just drive. Places at the sessions can be booked online at eventbrite.co.uk by searching for Coderojo Moray.